A new web tool for visualizing the timeline of the universe. The Earth is approximately 4.5 billion years old. In contrast, the history of humanity comprises an almost infinitesimally small fraction of this time. Most of us are aware of these facts, but it can sometimes be difficult to put them in perspective. As the comedian Eddie Izzard has noted, large numbers can leave us at a loss. Enter ChronoZoom. This new web tool, which began its life as the idea of a student in a course on Big History at UC Berkeley, allows the user to visualize the span of time from the Big Bang to the present by zooming in along an interactive timeline of events. You can try out the beta version yourself here. The effect is dramatic. Try zooming from the view of the Cosmos to the view of Humanity and back again. I almost wish that the shift occurred more slowly, giving the user more time to appreciate the awesome difference in scale between the history of the universe and the history of our species. 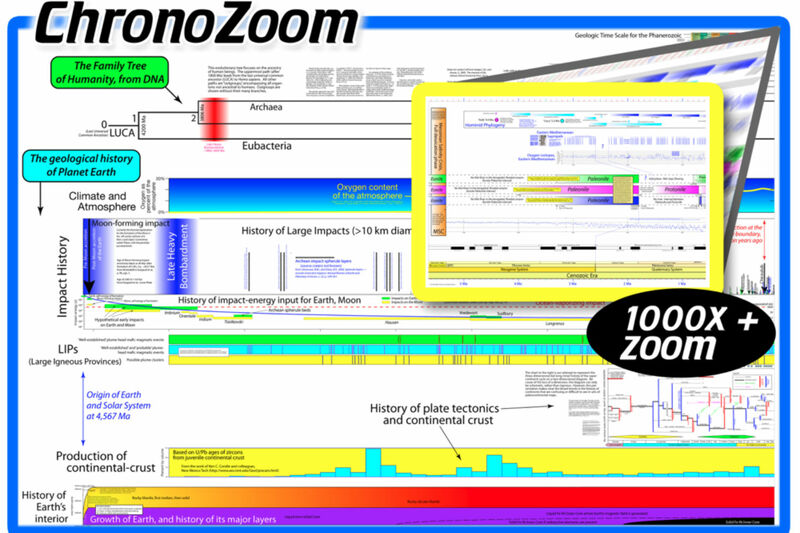 But even as isa, ChronoZoom’s visual timeline provides needed perspective. The beta version of ChronoZoom is really just a shell in comparison with what is to come. The plan is to fill in the timeline with multimedia “exhibits” that provide information about historical events. 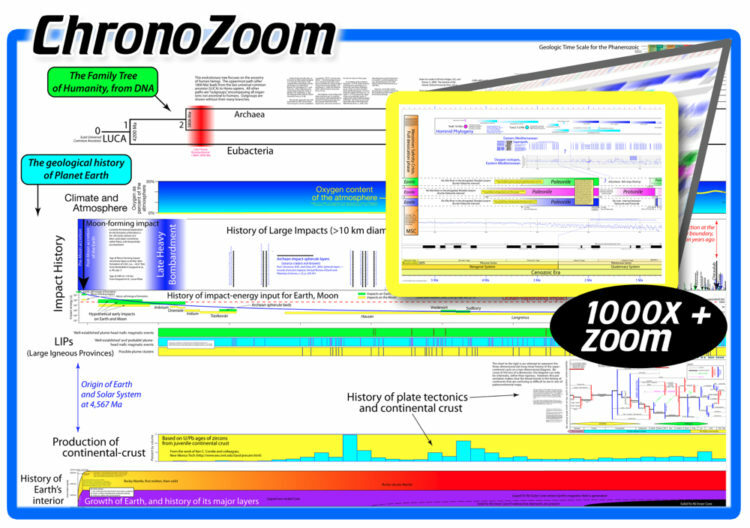 As described in the interview below, the completed ChronoZoom will be something like a web-based museum of time. In the interview, creator Roland Saekow suggests that there will ultimately be two versions of ChronoZoom: one crowd-sourced (a la Wikipedia), and the other curated by experts. It will be interesting to see how these versions of the timeline differ and converge. While a curated version might provide a more elegant and streamlined experience, the fervor with which the general public has participated in web 2.0 projects such as Wikipedia and Google Earth suggests that the crowd-sources version could end up providing the richer experience. Although the beta version truly shines in its capacity to represent large-scale time differences, I imagine that the greatest virtue of future iterations will be ChronoZoom’s ability to offer visual comparisons of events in human history, even very recent ones. As philosopher Arthur Danto writes: “a particular thing or occurrence acquires historical significance in virtue of its relations to some other thing or occurrence in which we happen to have some special interest, or to which we attach some importance, for whatever reason.” The ability to visualize the temporal relations among events might offer new perspectives on what aspects of the past should be deemed significant. This potential offers another reason why we might be particularly interested in the crowd-sourced version of ChronoZoom. The events represented in the curated version will be filtered by a relatively smaller number of experts who have already made determinations about the significance of past events. What is significant to an expert might be quite different from what the average user deems worth adding to the timeline. Thus the crowd-sourced version could afford the opportunity for comparisons that have yet to be made, potentially expanding our view of the canonical significance of past events. As with all tools, the effectiveness of ChronoZoom will be contingent upon how we use it. But it has the potential to enhance our thinking about the past in new and exciting ways. Arthur C. Danto, Analytical Philosophy of History (Cambridge University Press, 1965), 167. 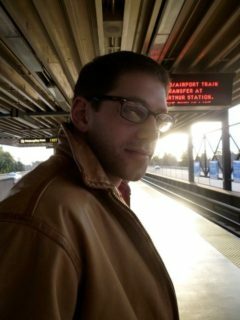 Erich is an Assistant Professor of Philosophy at Wellesley College. He researches and teaches moral and political philosophy, environmental ethics, heritage ethics, and philosophy of art.